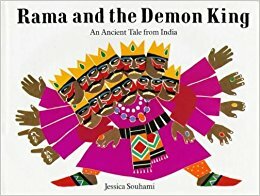 This is a bold and beautifully illustrated traditional Hindu tale of Rama and Sita whose bravery and goodness triumphs over a jealous stepmother and the vengeful ten-headed Ravana, King of all the Demons. With help from Hanuman, leader of the monkey army, Rama and his loyal brother Lakshaman escape from the forest, defeat Ravana, free Sita and together return to India. After learning of his father’s death, Rama is made King and rules wisely and well. The suspense in the story is highlighted by the use of paper cut-outs, dramatising the action like colourful puppets on the page. Read the story aloud, taking time to talk together about the pictures as you do. Take time to look and talk about the cover. What does your child notice? What kind of story might it be? As you read the book allow time to pause for your child to predict what might happen next, before turning the page. Talk together when your child wants to discuss anything they notice, ask a question or wonder about the story, characters, illustrations or layout. After finishing the book, share favourite parts of the story and favourite illustrations and talk about why you chose them. Talk about any morals or lessons from the story. What would your child tell someone else about this book? Use coloured card and either a pencil, paintbrush or wooden spoon. Use it to retell the story, perhaps from the chosen character’s point of view. Make a bridge for Rama and Hanuman to cross the sea to rescue Sita, using cardboard tubes and egg boxes, sticky tape and glue. Balance increasingly heavy objects on it to test its strength.